When looking for the right intern, companies need write job descriptions that stand out against the rest. Strong interns will be looking for specific benefits and experiences to gain from their internship. They want to not only grow in their specific fields but be accepted by a company as one of their own. Interns are not interested in doing busy work, but need to feel like they are making a difference that will grow with the company long after the internship is over. Here are the top five qualities that interns look for before applying to an internship. Interns are generally looking for the ability to apply all the skills and lessons that they learned in classes or certification courses, but those are not the only skills they are generally looking to practice. They are looking to expand on their professional skills as well. Being able to dress appropriately, knowing how to conduct themselves in an interview and general office conversation and how to collaborate in a team setting, are all important skills that interns are looking to experience in their internship. They want a taste of what they will get in the “real world” when they enter the workforce as an employee. “I learned how to handle myself with an employer, how to work with others, what to do when they aren’t around and just little things like that,” Morgan Usher, former intern-turned-employee at Daniel Menu and Party Consulting, reflected. Another benefit that internship programs can provide to entice interns to come to their organization is the ability to network. Interns look for the ability to network with not only outside organizations and professionals, but also with those in their own organizations. These kinds of social networks offer future references and support groups during their internship. It allows interns to grow in their soft skills and expand the amount of opportunities that await them in the future. The Regional Internship Program offers a free summer internship series which creates these programs for the organizations in Northeast Indiana. “As college student is extremely important to network yourself and meet new people. 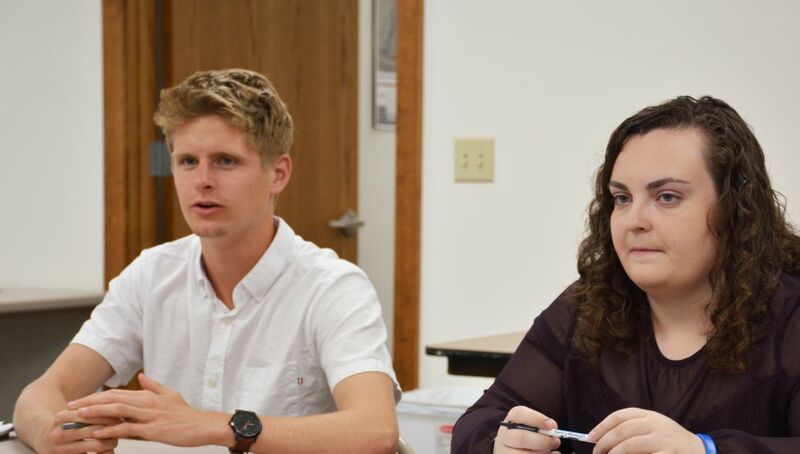 I can honestly say I had no idea that there was anything in Wabash, and those experiences give new outlooks on career paths and different industries that need help,” Kira Hall, an intern at Grow Wabash County, explained when asked what she wanted to get out of her internship. There is flexibility in the internship to allow an intern to experiment and explore their interests in specific fields and industries. It is true that intern should be treated like an employee and expected to do quality work. However, it is also the time to provide opportunities to let them explore their interests. If you have multiple projects that could be done, allow your intern focus on one that speaks to them and is something they are excited and proud to work on. “My degree is so broad, this helped me narrow down what I actually have passions for and what I want to do after I graduate,” Tara Zahnke, a Vera Bradley continuous improvement intern, revealed. Photo caption: Interns Chase Clifford, Sarah Brennan and Justin Ehlers sit down with 80/20 CEO Patrick Buesching to connect and discuss projects. A sense of belonging is important to anyone when looking at an organization. That is no different for an intern. Interns must feel comfortable to speak up, share ideas and most importantly ask questions. When they are part of the team the intern is more likely to have a positive experience and talk about the company and their opportunity more favorably. They should not feel like they are just another intern that will be forgotten once their internship has ended, but one that has made strong and true connections with the team. “I came to 80/20 and everyone was like, 'Hey come visit [the different departments] anytime and don’t be a stranger.’ It was very heartwarming and even a little exciting to have them really care,” Sarah Brennan, the web design intern at 80/20, described about an event that happened when she walked past another department. The number one thing that interns are looking for from an internship is the ability to make an impact. The stereotypical coffee grabbing intern may be appealing to those looking to be a personal assistant. Otherwise, these interns are looking for the ability to work on projects that will effectively help the company long after they have left. Meaningless tasks may give them some skills that are important and are okay for some task. However, an intern’s big projects should focus on fueling their passions and helping the company in an impactful way. “An intern to me is a very valued resource. They are able to do a lot of high-quality heavy lifting work, that otherwise would not be able to be done as quickly as they can do it,” Parker Beauchamp, the CEO of INGUARD, reasoned on why interns are so important. A bonus tip that will help attract interns is to pay them. This is extremely important to bringing in interns from outside of the region, or attracting the talent to Northeast Indiana because they have a good chance of needing to pay for housing. It also helps create a more robust internship program. It makes the company invest more time and energy into the intern as they have already made the monetary investment. The organization that pays interns generally is better and more prepared for their intern. “We are one of the very few in the country in television that pays our interns. It allows us to do something different than those who don’t. We see them as employees, which means we will teach you, train you, and give a tremendous amount of feedback. You are a part of our team,” said Jonathan Shelley the news director at WPTA.